We are locally owned and dedicated to serving the markets of Dutchess, Orange, Putnam, Rockland, Sullivan and Ulster counties as an independent Pepsi franchise since 1946. Pepsi-Cola is in business to produce and sell quality products that will make a profit and thereby contribute to the welfare of its employees and to the local communities in which we operate. In order to achieve our Company purposes, we employ capable people, provide training, development, and opportunities for advancement, and offer equitable rewards, pay, and benefits in exchange for their contributions. As an employer, we are interested in the personal advancement, well-being and security of our employees and their families. And, as a result of our cooperative efforts, we are able to provide our customers with products and services that will merit their continuing confidence. This is how we remain competitive and keep growing. Our charter is a simple one. It is to be the low cost producer and distributor of quality products with superior execution. Facilitating the type of growth and development described above requires us to strive together to become a “Distinctive Human Enterprise”. This means that the Company believes that in order to achieve the “low cost producer” status, we must create and foster a work environment which encourages effort, prudent decision making, teamwork, professional nourishment and individual growth. In 2015 we modified both of our plants to use solar energy. Our Newburgh plant is designed to have 50-60% coverage and our Bristol plant is designed with 100% coverage. The majority of our fountain syrup products and beverages packaged in plastic bottles are transported in reusable HPDE shells. By using these shells, instead of cardboard, we reduce waste and litter. Our facility is outfitted with energy efficient lighting; with the latest improvement being the replacement of all exterior lighting being replaced with LED fixtures, reducing electric consumption by 75%. Another improvement was the replacement of metal halide warehouse lighting with T-5 high output florescent fixtures with motion detection on/off switches. These new fixtures use less than one half of the energy previously required. The sales team vehicles now average 32mpg. Our merchandiser routing software has saved 330,000 miles in the last 3 years. Delivery routes were restructured to reduce mileage and save fuel. Nearly all of our paper and cardboard used on-site is recycled. Every day our trucks bring empty bottles and cans back to our facility from our customers. These are regularly sent for recycling. These are some of the examples of how we, at Pepsi-Cola of the Hudson Valley, strive to be more environmentally conscience; and this is just the beginning! Our intention is to continue investigating even more methods by which we will become increasingly effective and efficient in our energy usage. 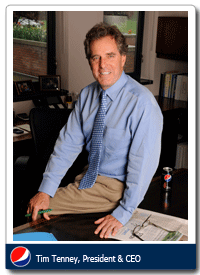 Tom Tenney, in 1946, purchased the Pepsi-Cola Newburgh Bottling Company, Inc. from Harold Gottfried. 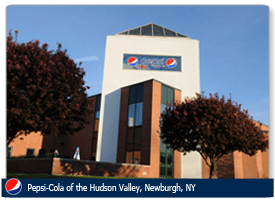 Pepsi-Cola Newburgh Bottling Company, Inc., under Mr. Tenney’s guidance, expanded to bottle, distribute and sell Pepsi and allied products in its present service area of Orange, Rockland, Sullivan, Ulster, Dutchess, and Putnam counties in New York. After World War II, Tom bottled Pepsi on DuPont Avenue in Newburgh, until December 1979. Pepsi-Cola Newburgh Bottling Company, Inc., in 1946, was a mere shadow of our major competitor. Today, after many years of dedicated efforts by many past and present employees as well as a continued reinvestment of profits, the Company has flourished. In June 1996, we proudly moved into our present facility located at One Pepsi Way. Successful, profitable business ventures do not just happen. It is a gradual business process based on sound judgement, hard work and determination. This has occurred and continues at both locations. Over the years, each company has added other successful brands including products such as Gatorade, Schweppes, Lipton, A & W, YooHoo, Sunkist, Ocean Spray, Hawaiian Punch and various other products. Pepsi and the majority of the products are produced at our production co-ops which are: Clinton’s Ditch Cooperative, Cicero, NY; Epic, Inc., Ayer, MA; CPF, Inc., Ayer, MA and Northeast Hotfill, Ayer, MA. We are proud of our history and of our past accomplishments, but we are a Company not about to rest on our laurels. We are a Company committed to improving our operations, adjusting to change in the working environment, and most of all to growth. We believe that progress is best served when we savor the past but look to the future realizing that today’s actions, decisions, and spirit of competitiveness provides us with the foundation and the tools necessary to be the best we can be. As Tim likes to say, he was born and bred in the Hudson Valley. 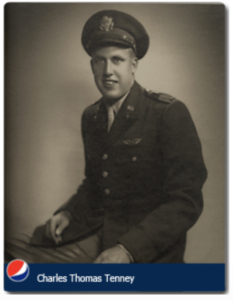 His dad, Tom, purchased the Pepsi-Cola Newburgh Bottling Company in 1946. Tim started working summers on the night shift of the bottling line at 13 years of age. After high school, he attended the University of Denver where he graduated in 1973. Following graduation he became their Lacrosse Coach; a position he held until 1976. He came home to the family business that year and in 1983 became President. In 1989 he was named CEO. Tim is on the Board at Marist College where he has been serving since 1999. In his spare time he coaches junior high lacrosse and lives for pond hockey. 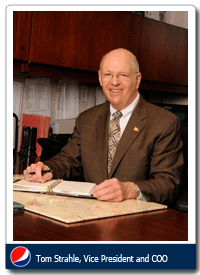 Tom graduated St. Bonaventure University with a BA degree in 1970 and an MBA from Monmouth University in 1979. Tom began his soft drink life at Pepsi Asbury Park, NJ as a summer driver salesman in 1967 where he worked for 4 summers. In 1971 he was promoted to Full Service Vending Supervisor and in 1977 he was again promoted to General Sales Manager. 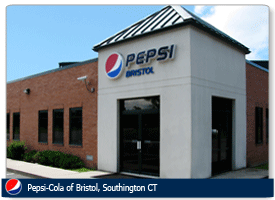 After Pepsi Asbury was sold, Tom became the Area Food Service Manager for Northern NJ and Westchester County, NY. He subsequently was Director of Food Service for Pepsi New York City. In 1988 he came to Pepsi Cola of the Hudson Valley to work for Tim as VP of Sales and Marketing. He became VP &COO in 1991. 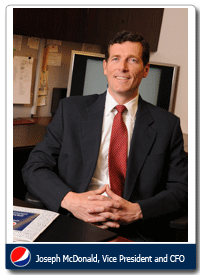 Tom serves on the Board of Catholic Charities Community Services of Orange County as Vice Chairman. Tom recently started riding a bicycle. He currently is training for the Erie Canal cycling trip Buffalo to Albany. 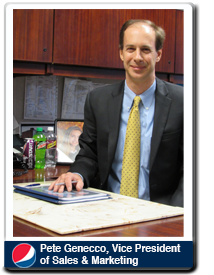 Prior to coming to work for Pepsi-Cola Newburgh, and after graduating from Hamilton College, Joe spent twelve years in the finance industry working all over the northeast, including Manhattan and Boston. Joe and the company’s president Tim, met in 1989 and Pepsi Newburgh quickly became Joe’s favorite client. They built a rapport over the next 8 years that eventually brought Joe here in 1997 as the Chief Financial Officer and Director of Operations. Joe’s time has been marked by the pleasure of daily interaction with many great co-workers & employees, the addition of a few hundred new beverage products, a new building & addition in Southington and a major expansion in Newburgh. More to come! Joe spends much of his free time engaging in sports, both old and new. Tennis, golf and basketball are part of his weekend quasi-triathlon, all relying on his constantly improving, and needed, weekday recovery skills. Looking back on the summer of ’86, Pete remembers the pride of joining the beverage war on the blue side, Pepsi, The Taste of a New Generation. He was completely hooked on the fast pace of the beverage business after three summers as a Driver Salesperson in Syracuse. Pete graduated from Siena College with a BS in Finance in 1989. He returned to Pepsi Allied after college, working as a Driver Salesperson, Bulk Salesperson, and Area Manager. After Allied Beverages was sold, Pete was hired by Pepsi. Pete enjoyed the business collaboration with Tim’s Hudson Valley team during those 17 years, admiring their passion for the business and their collective will to compete and win in the market. Returning to the culture of pride and camaraderie that is pervasive in a family owned Pepsi business felt like coming home to him. Charles Thomas (Tom) Tenney, born in 1920, was a B17 pilot in the German Theater during WWII. After finishing in the German Theatre he was training to fly over Japan when the war ended with the dropping of the atomic bomb. After returning from the war he went to work for the Pepsi Cola Company. Early in Pepsi’s history they had sold franchise rights to individuals all over the United States to establish a nationwide distribution system. When the Pepsi-Cola Newburgh Bottling Company became available in 1946, he purchased it. Through hard work and perseverance he grew the brands and re-invested in the business to make it successful. His re-investment in the business is what drives us forward today. Mr. Tenney passed away in September 2013 just before his 93rd birthday. He will be greatly missed. Some people think “eat an apple a day” but Mr. Tenney’s secret was to “drink a Pepsi a day”!